This collection presents the stories of our contributors’ experiences and insights, in order to demonstrate the enormous potential for openly-licensed and accessible datasets (Open Data) to be used as Open Educational Resources (OER). Open Data is an umbrella term describing openly-licensed, interoperable, and reusable datasets which have been created and made available to the public by national or local governments, academic researchers, or other organisations. These datasets can be accessed, used and shared without restrictions other than attribution of the intellectual property of their creators. While there are various definitions of OER, these are generally understood as openly-licensed digital resources that can be used in teaching and learning. 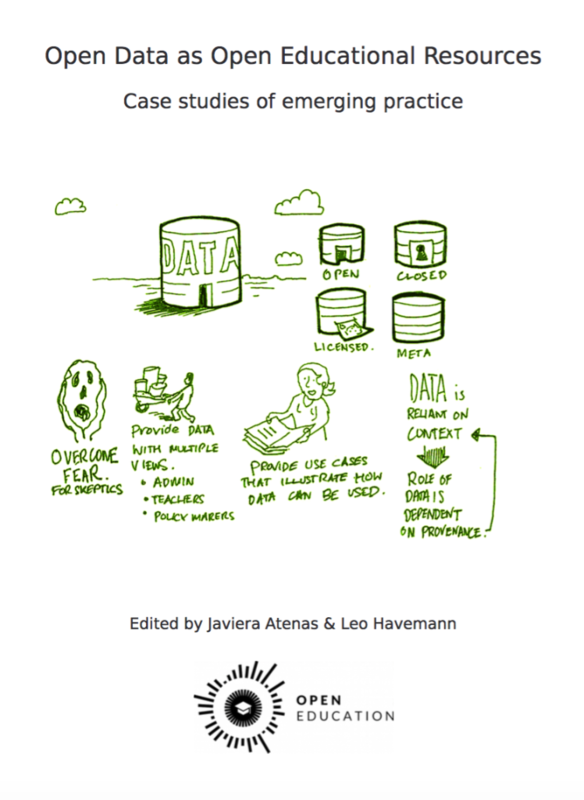 Open Data as Open Educational Resources: Case studies of emerging practice is an edited collection by Javiera Atenas and Leo Havemann, available openly and published online through the Open Knowledge Foundation. On the basis of these definitions, it is reasonable to assert that while Open Data is not always OER, it certainly becomes OER when used within pedagogical contexts. Yet while the question may appear already settled at the level of definition, the potential and actual pedagogical uses of Open Data appear to have been under-discussed. As open education researchers who take a wider interest in the various open ‘movements’, we have observed that linkages between them are not always strong, in spite of shared and interconnecting values. So, Open Data tends to be discussed primarily in relation to its production, storage, licensing and accessibility, but less often in relation to its practical subsequent uses. And, in spite of widespread understanding that use of the term ‘OER’ is actually context-dependent, and, therefore, could be almost all-encompassing, the focus of OER practice and research has tended to be on educator-produced learning materials. The search for relevant research literature in the early stages of this project turned up sources which discuss the benefits of opening data, and others advocating improving student engagement with data, but on the topic of Open Data as an educational resource specifically, there appeared to be something of a gap. We should pause here and stress that we are attempting to characterise general tendencies of the OER and Open Data movements; we acknowledge that certain voices have nonetheless been speaking across the divides created by these ‘open silos’ and our purpose in this collection is really to add to and amplify this important work. One document to tackle the interface between Open Data and OER explicitly is the collaboratively-authored Open Education Handbook from Open Knowledge, which discusses Open Education Data as both openly available data that can be used for educational purposes, and open data that is released by education institutions. Our focus in this collection tends to the former understanding: the use of Open Data in education, rather than about education (though in either case the data could inform interesting student projects). Another noteworthy source on the topic is the set of resources provided by School of Data, an Open Knowledge-related project that provides guidance and support for students, educators and researchers working with Open Data in educational contexts. The School of Data provides online self-access courses, and also guidelines for understanding Open Data in the form of a handbook, and for the adoption of software for data analysis. Additionally, the resources from School of Data have been translated into Spanish, French and Portuguese, in order to assist significant numbers of educators internationally. Open Data has been highlighted as a key to information transparency and scientific advancement. Students who are exposed to the use of Open Data have access to the same raw materials that scientists and policy makers use. This enables them to engage with real problems at both local and global levels. Educators who make use of Open Data in teaching and learning encourage students to think as researchers, as journalists, as scientists, and as policy makers and activists. They also provide a meaningful context for gaining experience in research workflows and processes, as well as learning good practices in data management, analysis and reporting. The pedagogic deployment of Open Data as OER thus supports the development of critical, analytical, collaborative and citizenship skills, and has enormous potential to generate new knowledge. Our unexpected journey in producing this collection has been a series of steps, sometimes taken while not quite seeing the path ahead. We began with a question: was anyone actually using Open Data as OER? and sought responses using a blog post and exploratory survey, which generated some initial feedback. Despite efforts to promote the survey widely, the response rate was relatively low. While all those who responded said that they were indeed making use of Open Data in their teaching practice, it became clear from the examples given that only about half of the respondents were actually using Open Data, rather than other forms of open content, such as OER, or datasets that were not actually ‘open’ as such. This indicated to us that there may be a lack of awareness and understanding of Open Data among educators. It occurred to us at this point that we should focus our attention on two distinct projects. On the one hand, with Ernesto Priego, we continued to develop our ideas regarding the benefits and challenges of bringing Open Data into teaching and learning. This work became a research paper entitled ‘Open Data as Open Educational Resources: Towards Transversal Skills and Global Citizenship’. Here we focused on research- and scenario- based learning models, considering the application of these to open datasets as a way of developing students’ transversal skills and twenty-first century literacies, alongside more traditional subject-related competencies. At the same time, we remained convinced that the question of whether educators were actually already training students in the interrogation of Open Data had surely not yet been settled by our survey. In fact, we suspected that good practices must be out there, and might be captured in a useful and approachable way through a call for case studies. The response and the results were gratifying. And so, finally, at the core of this book we have five case studies of open educational practice, in which Open Data takes centre stage in learning. These case studies showcase diverse practice at an international level, including studies from the UK, Canada and Italy. Different approaches and disciplines are represented, reflecting different kinds of data, across different educational levels, to highlight the development of citizen engagement. The cases are more proof-of-concept than ‘howto’, and we prefer to let them speak for themselves rather than describe them in detail here. We simply wish to express our delight at the range of innovative work that has been surfaced by the authors. By extending their commitment to open practice beyond the classroom through the act of sharing these accounts with others, our contributors have produced a set of open resources to inform, assist and inspire other educators. Our collective hope is that through the work of opening up practices as well as datasets, we are starting to create the conditions of possibility for the reuse and remixing of pedagogical ideas and learning designs around Open Data. We contend that opening content and practices is a necessary step, but one which must be taken with a higher purpose in mind. Open is not the destination, it is only the beginning. Open Data as Open Educational Resources: Case studies of emerging practice is licensed under a Creative Commons License 4.0 International license. This license lets others distribute, remix, tweak, and build upon the work, even commercially, as long as they credit the author for the original creation. This is the most accommodating of licenses offered and is recommended for maximum dissemination and use of licensed materials. Adapted from https://education.okfn.org/files/2015/11/Book-Open-Data-as-Open-Educational-Resources1.pdf under a CC-BY license.